Mango pudding is one of the easiest mango dessert recipes that even a 10-year-old can make. I am yet to met someone who doesn’t relish the king of fruits. I can eat it in any form, any time of the day and I like to make a lot of mangolicious recipes before the season ends. In continuation with my mango mania series, I present to you a wonderful mango based dessert. Quick to make, minimal ingredients and super yummy. There is nothing more pleasurable than digging into a bowl of chilled pudding especially a fruit based one like mango pudding. Heavenly on hot summer day! I am going the eggless way with the mango pudding recipe. Agar agar or china grass is the vegan option instead of eggs or gelatin. You can use the strips or powder form of agar agar. You will find agar agar aka china grass in any major departmental store in your city or an online grocery store. 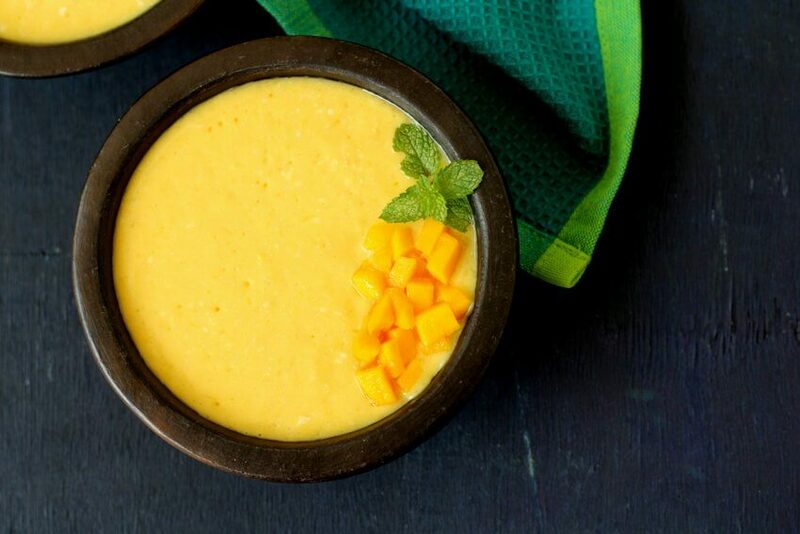 Ripe mangoes with a soft flesh with less fibre works best for this pudding. Suvarnarekha, rasalu, banganapalli, alphonso, kesar varieties are ideal for most mango desserts recipes. 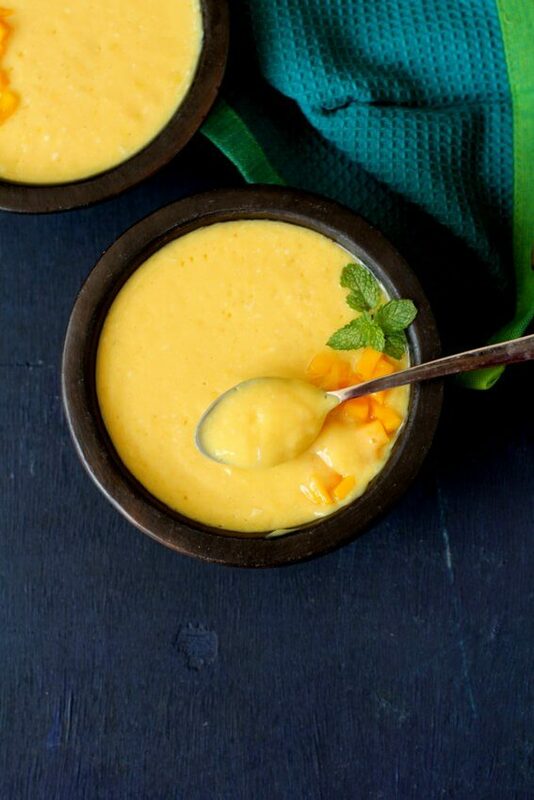 I have followed a very simple mango pudding recipe that uses skimmed milk and minimal sugar. It is not a rich or overly sweet pudding. There is minimal use of sugar or honey since mango provides the aroma and natural sweetness to this dessert. The texture is more of a cross between a thick pudding and a runny sauce. A very soft pudding with melt in the mouth texture. Soft, creamy, tropical and decadent dessert for those who love mangoes and have a sweet tooth. I like to garnish the pudding with chopped mango for that intense mango flavor. You can add soaked sabja (basil seeds) or chopped nuts for some crunch. Mango pudding made with agar agar is gluten free and can be easily made vegan by using coconut milk instead of milk. Mango pudding with coconut milk is delicious too. A perfect go-to dessert during the summer season when mangoes are available abundantly. 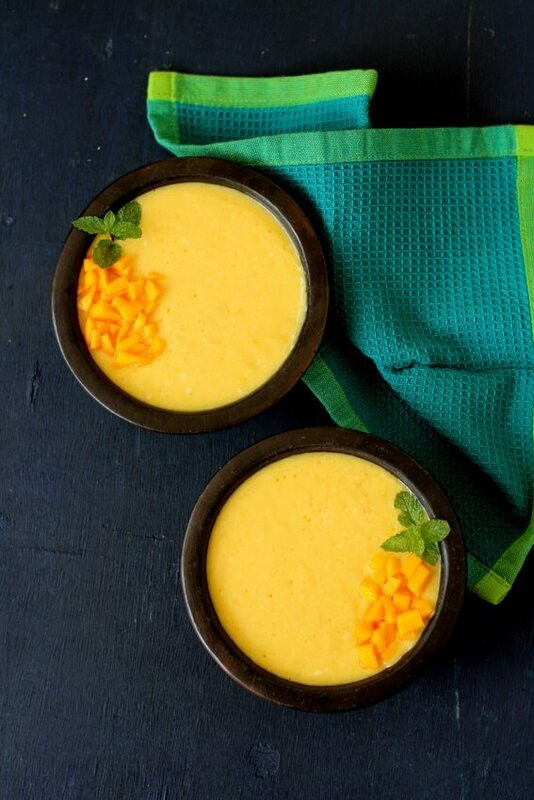 Serve the mango pudding in shot glasses for your parties or get together and it is sure to be a hit. 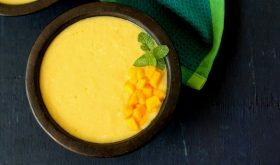 Puree the ripe mango pieces and one fourth of the milk to a smooth puree in a blender. Remove to a bowl and set aside. Place the agar agar along with the water on low heat and keep stirring till the agar agar is completely dissolved. Bring the milk to a boil, add sugar and cardamom powder. Simmer on low flame for 3-4 mins. Add the agar agar mixture and keep stirring on low flame for 4 mins. Turn off heat and allow to slightly cool but should be warm. Add the mango puree to the agar agar mixture and mix well. Pour the mixture into serving bowls. Allow to set at room temperature and cover with plastic wrap. Place in the fridge for at least 3 to 4 hours. At the time of serving, garnish with mango pieces and serve chilled. Add sugar according to the sweetness of the ripe mango used to make the pudding. Ensure the agar agar dissolves completely before adding it to the simmering milk. For a thicker consistency pudding, use 1/2 cup milk instead of 1 cup. Hi Sailu, Can we use a gelatine sheet instead of agar-agar? This dish looks tremdously delicious. The perfect summer shot i believe. Cannot wait to make it on my own. Can you make this with canned mango pulp instead of fresh mangoes? What is the measure of agar agar and mango pulp? Yes you can though the flavor will be compromised. I am not sure of canned mango pulp so I will give approx measurements. Use 7 gms agar agar for 2 cups of canned mango pulp. I’m salivating by now! Great recipe! how many people can we serve this to according to the amount given in the ingredients? Use 1/2 tbsp gelatin powder. Sprinkle the powdered gelatin in 1/4 cup of cold water and stir to combine. Let it rest for 5-10 mins, or until the gelatin absorbs the water and becomes like a wiggly mix (blooming stage). At step 3, instead of agar agar mixture, add the bloomed gelatin and be sure to stir thoroughly to dissolve it.